How did you become interested in hair and make up as a profession? Originally I wanted to be an actor, so I went to university to study Performing Arts. I started designing the hair and make up looks for performances at uni and discovered a love for it. I thought that if I kept acting as a talent on the side, I could work as a hair stylist and make up artist alongside acting. I graduated, and my dad suggested professional make up artistry training as my next platform, to understand every aspect of it. I was accepted at Delamar Academy, next to Ealing Studios. I was there for four months on a short course and learned wig work, postiche [a hairpiece], special effects, prosthetics, hair styling and anything else you can imagine! I was preparing myself for every single route. I could use my knowledge and experience around the camera to create high quality work. I got in touch with the presenter at MTV, and she hooked me up with the lead make up artist there. At that point I decided that I’d never go back to acting! I had become too shy in front of the camera and preferred making people up and seeing how happy they were with the final outcome. Weddings followed naturally from that and I have been getting busier and busier with them. I have worked with many different brides, and every day is a new challenge. You get a real mix of personalities, so you need to approach each job with a positive mindset and have that positivity rub off on the bridal party, who are nervous as well as excited. I always suggest that they have a glass of prosecco to calm them down! I bring a range of scented setting sprays with me including coconut and lavender, which helps to achieve a calming effect. I also bring a small gift for the bride to every booking; it is important to recognise that that bride has chosen you over many other possible MUAs. 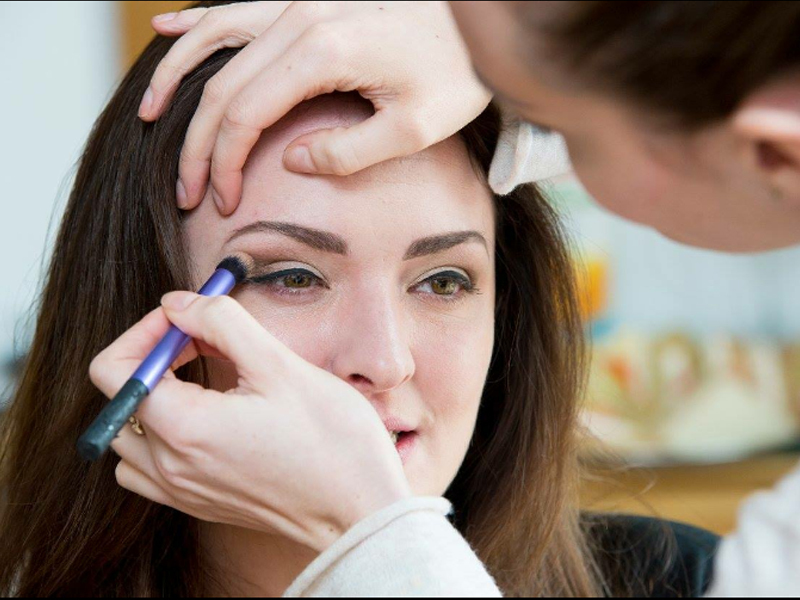 Gemma Peace trained at the Delamar Academy and has wedding clients from all over the UK. There is pressure that comes with my job, but the important thing is to approach it calmly. If the bridal party notices that you are stressed out, it stresses them out too. I don’t think I have ever worked at a wedding where I haven’t organised a trial beforehand. Some people say ‘I don’t want a trial before, I only want to look like that on my wedding day’ but in my experience I would advise against this, as timings will run more smoothly and you will have a better outcome with a trial. Gemma adds some final touches. Some brides opt for subtle and elegant while others take a more extravagant approach. 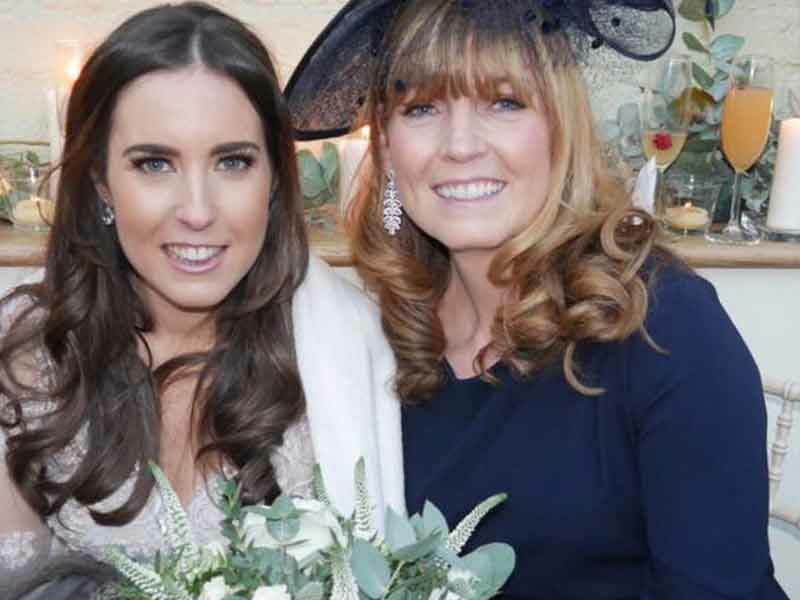 Gemma always ensures that she builds an excellent relationship with the Mother of the Bride. What unusual weddings have you worked at? I have worked on a few themed weddings before, including Alice In Wonderland, which was interesting, as the party wanted old-fashioned victory rolls in their hair, a fake mole, and so on. Some people are very traditional, while others just want to party! Who do you work closely with on the day? I work with the whole bridal party and a wide range of ages. I coordinate what I’m doing with the photographer and work closely with them, so I know when they need to come in to the suite to take photos of moments such as the lipstick prep on the bride. Some brides like to have photos of me putting powder on their face, adding last minute touches. 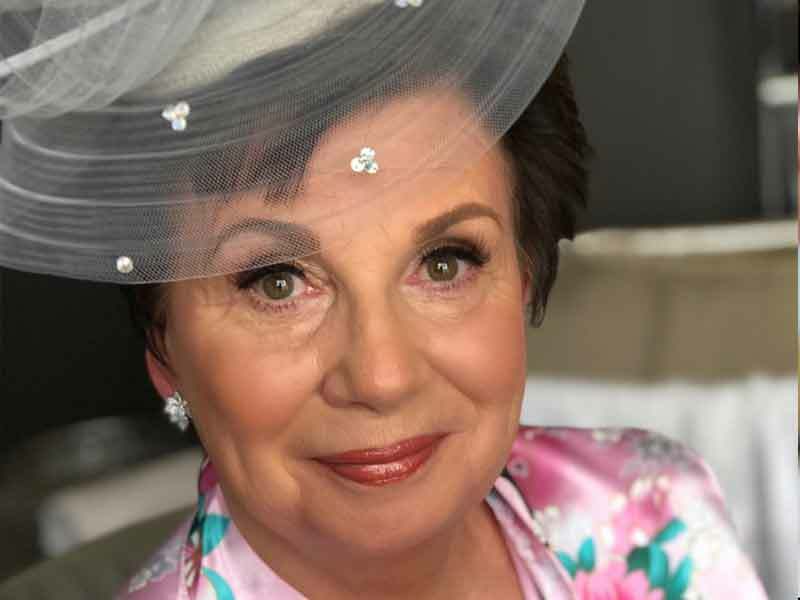 It is important for me to get close to the Mother of the Bride, as sometimes they can be more stressed out than the bride themselves! Most weddings are quite relaxed though. I ensure that I say hello to everyone and make them feel comfortable, so that everything runs smoothly. How have make-up trends and styles changed during your career? Make-up has definitely got progressively heavier since I first started. Who knows, it could be the influence of the Kardashians?! But trends are forever changing. Flawless perfection is what people tend to ask for, and this very difficult to achieve. I have sat down with bridal parties for a long time in advance, just to make sure that what they have in their minds is what they really want. I advise them to bring a picture as a reference, but it is important to note that what looks good in a photo may not suit you as a person, due to different face shapes and features. But this is all part of the trial stage. A selection of photos is preferable, and not one of themselves as I always want to do what complements their face and what suits them, rather than basing it on what they have created on their own faces before. Some people have poker-straight hair and they come to me wanting it really curly for their wedding day. With the best will in the world, this is not going to last – it is going to drop. It is important to be realistic in what you are trying to achieve. A lot of the weddings I have done recently have been either hair down, half up and half down, or a curly blow dry. One thing I have noticed is that a lot of girls don’t like their ears showing. Even though it is quite elegant to have hair away from the face, brides often like to have their ears covered or partially covered. Personally I think that hair up looks more elegant, but it also depends on what dress they are wearing. I always ask to see the dress and often base hair and make-up around it, because if they have a lot of embellishment in the dress, you wouldn’t choose to have glittery eyes too; you’d want to play it quite simple and have more of a glowing look. If the dress is a bit plainer you could have a red lip on your wedding day, or bigger hair. What was the most memorable wedding you worked at? I did a wedding at Hedsor House in Buckinghamshire which was unbelievable. It was a Russian wedding, and it was the only one that I didn’t do a trial for. I had one day’s notice! It was a party of five people. They had gone all out for this wedding: the flowers were amazing and the setting too. The bride wanted loose, wavy hair. It sticks out vividly in my memory because everyone was so extravagant and there was a real party atmosphere in the room while everyone got ready to loud music. Other times though, the bridal party wants to get ready at home in their own space, because they are more comfortable there. But some clients want to be in an extravagant setting because it makes them feel their best – in this way it has similarities with acting. People end up seeing themselves as other people, and have a new-found confidence. Weddings can be a stressful occasion for families, so a positive mindset and calming influence is paramount. Gemma has used her acting and production experience to good effect, and also performs make up work for film and TV. Wedding clients are aiming for flawless perfection. What feedback have you had from clients? So far, I have never had anyone say they don’t like my work. I’m not expecting this to continue forever, but so far so good! I always stay until they are totally happy, to give my best service and keep my reputation. Service and giving that little bit extra is so important. What are the most common questions you are asked? Everyone asks me about spray tans and whether they should have one. If you have a spray tan on your face, the make-up can go quite ashy, so I request that brides have a spray tan only up to their chest, which means I can blend in the rest and go round that area. Also, having a spray tan blocks your pores, and they could break out into spots, especially with potential nerves and worry, which is best avoided on your wedding day. I suggest having a facial a few weeks before. It is relaxing, it is good for your skin and is a real treat. Not many future husbands want to see their fiancee caked in make-up, it is not what they are used to seeing and it goes without saying they are in love with the person as they are. Some people want to change their look for their big day, but then they look back on photos and think ‘I look nothing like me’. What other requests are popular? Eyelashes have come more into fashion. People are going to lash professionals to have them individually stuck on. From my knowledge, they last as long as your own last and naturally fall out with your lash growth. I personally prefer strip lashes that I apply on the wedding day and the client removes at night as different false lashes suit different eye looks. Do you find yourself competing with blogs? It is definitely true that people are influenced by bloggers and trends, and therefore may request certain lipstick shades or products. I am here to advise people as well as work with them and often they are happy to listen to my opinions. When people endorse products, it may not be because they believe the product is nice and beneficial, but rather just to sell it. Being a professional artist, suggesting gorgeous products to my clients is something I adore because I then know they will not be wasting their time and money. 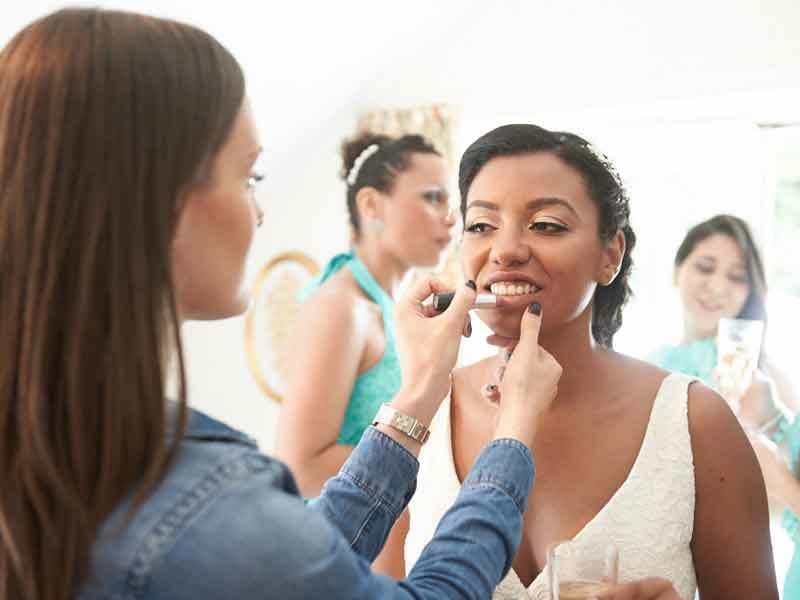 Why is a MUA so important at a wedding? To find out more about Gemma, follow her on Instagram @gemmapeacemua or click here https://www.instagram.com/gemmapeacemua/. Looking for more tips on booking live music or other services for your wedding? Contact me here.